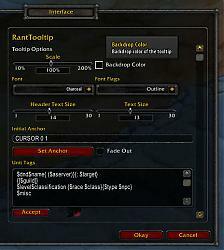 This addon is an alternative to just editing a layout to configure RantTooltip. These are GUI options. They should work with any layout. Make sure you have the latest version of RantTooltip before using these options. what is the slash command to pull up the config options? I can't find it documented anywhere. Maybe I am just not doing it right, but I can't seem to make the options menu appear for the other layouts, I.E. Exaile. Am I installing the files wrong? 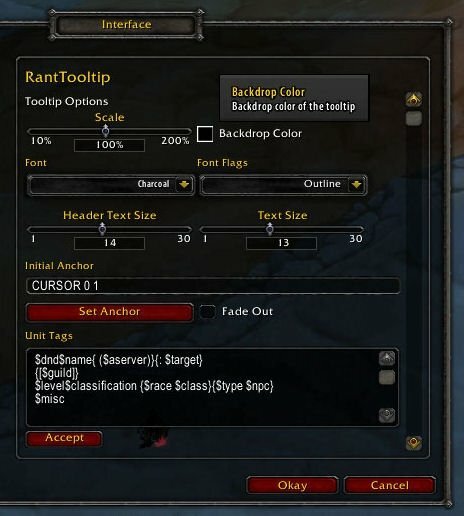 I unzipped rant_tooltip rant_tooltip_layout rant tooltip options and rant tooltip exaile all into my addons folder, then i make sure that rant tooltip layout is disabled when I log in right? and instead select exaile? Yeah, whenever I use this with Exaile, that layout stops working. I'll add that as an option soon. Maybe I didn't find it, but could make an option, that the tooltip is not displayed when you are in combat?